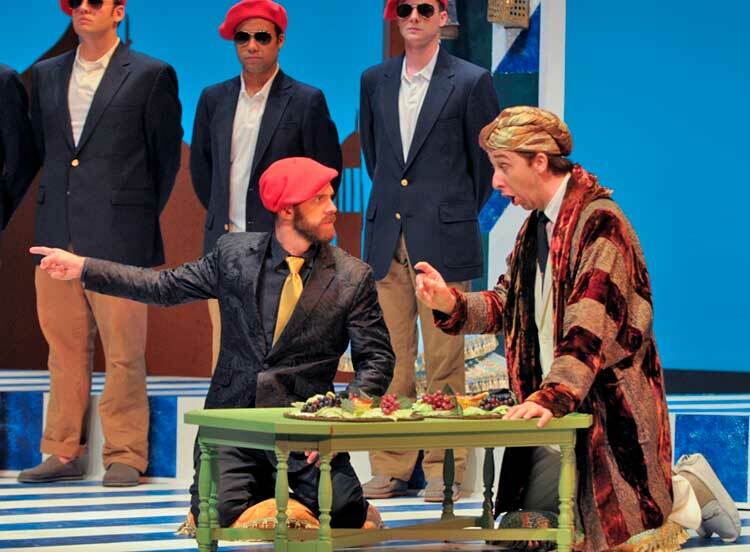 Rossini’s L’Italiana in Algieri (in this production, “The Italian Girl in Algiers”) received a rare performance on Wednesday, July 27, at BU’s Tsai Performance Center in a production of Boston Midsummer opera conducted by Susan Davenny Wyner. Composed in 1813, this opera’s popularity has relied on vocal pyrotechnics that simply weren’t always available or in style. When heard live, in a performance as good as this one, we realize how terrific this opera buffa is, full of florid arias and humor. (The opera will be performed again on July 29 and 31). L’Italiana… was an instant hit in Venice and then traveled all through Europe. The lead was sung by one of Rossini’s singing mistresses. Its overture stayed popular throughout the early twentieth century, even while the rest of the opera was pretty much forgotten. The orchestra parts seemed tame compared to the formidable demands on the singers. “Even in his lifetime, no one could sing his stuff really well,” Dyer quipped. After its initially popularity, it was over a century until the Metropolitan opera performed it four times, in 1919 and 1920. It regained its stature when Marilyn Horne championed it, singing it thirty-seven times at the Met over a period of twenty-two years. The opera demands a very great mezzo-soprano, and on Wednesday, the fabulous Sandra Piques Eddy sang — and acted — the spunky heroine Isabella for all it was worth. Her feisty performance, which mixed eroticism with brainpower, was alone worth the price of admission. This was a truly extraordinary experience. What a voice! What slithery movement! She made Jay Lo look like a nun. The opera in these performances is sung in English, which I thought I’d mind, but the singing was so good I ended up not caring (although I would have loved it more in Italian, even if I only were to understand only half the words). I don’t usually notice stage direction, but when Drew Minter, the brilliant countertenor-turned-director is in charge, clever things happen, and much of the greatness of the evening was his doing. When Isabella made her first appearance, just having been shipwrecked, she blew onto the stage with white sunglasses on her head, some half dozen pieces of expensive luggage, white pants, top and sandals. She looked toned, tan, and terrific, as if she had just emerged from gym and shopping at Bergdorf’s. There was no way the Algerian shore was ready for this! This Italian girl- woman, more to the point, was not about to take orders from anyone. The setting, an Arab port, featured large diagonal parallel stripes and zig-zags of blue and white “tiles”; the background was a uniform light brown silhouette of minarets and domes. For the arrival of Isabella and Taddeo, they stepped out of a small sailboat (later called a “yacht”) that was dragged on stage. Isabella then met up with Taddeo, a comic character who pretends with her that he is her uncle. In the hands (voice, posture, rubber-face) of the marvelous David Kravitz, Taddeo is one of the funniest, and oddly endearing, characters in this opera. He sang terrifically, as he always does, and was another serious reason to catch this opera this week. “The way to tame a man, I know by heart,” Isabella sings, and we do not doubt this. When she insists that Taddeo is her uncle, no one dares doubt her. A superb male vocal quartet praise the powerful Bey of Algiers, Mustafa, (bass-baritone Eric Downs) saying he is a “tamer of women,” but when Isabella shows up again in a mid-length white sleeveless dress, she floors him with her beauty. Eddy’s got the posture and power of a Carmen. “She’s worthy of the Sultan!” he groans, all desire. He begs Taddeo to convince his “niece” to marry him. Taddeo, knowing he’s way out of his depth, looks like the cowardly lion in the Wizard of Oz. Meanwhile, Isabella’s beloved Lindoro (Bradley Williams) shows up, having been captured by Mustafa, and the star-crossed lovers (she was shipwrecked as a result of roaming the seas searching for him) get a chance to straighten out their respective love lives and escape, along with the rest of the cast. Williams has plenty of chances to navigate the high seas (and high Cs) of a terrifyingly hard vocal part that he handled rather well. Elvira, sung by Sara Jakubiak, the bey’s bride (beys can have four of these) was very good, as was her confidante Zulma (Julia Mintzer). Minter’s decision to set Anellis’s libretto in a modern, somewhat westernized Arab country works well. Minter’s Mustafa is more than just an old tribal leader; he is a wealthy oil sheik whose henchmen arrange “shipwrecks” on a regular basis. The plot is really (thank heavens) secondary to the singing, and for that, Boston Midsummer Opera is to be commended. The small orchestra was good, though perhaps drastically reduced. Nonetheless, Davenny Wyner put on a terrific show. It’s nice to know you can stay in town and still hear great music-making in the summer.